Please note that all accounts below are my own personal interpretations and experiences in Zimbabwe. Any mis-interpretations or inaccuracies are mine only. I only try to provide some background to those who have not heard of the past cash crisis or of the current economic cash-crisis situation in Zimbabwe. This will explain some of the situations that I have experienced, related in Bee the Solution Newsletter, dated November 2016. I am not taking any position and do not wish to do so. Zimbabwe has had economical challenges for some time now. And the current situation seems to be even worse (not having known the previous crisis, I am only relating what people are feeling). In the last couple of months (October-November 2016), the cash situation in the country has been a difficult one. There is no cash… and it is not a figurative way of speaking. We are not talking about the economy itself going down (even though it does), but really a lack of physical cash in the country. Regardless of the money you might have in the bank, you cannot get cash. Which makes things difficult as most payments have to be done in cash (and even more so for foreigners). I have met people who struggled to leave Zimbabwe, being unable to gather the USD in cash necessary to pay for the next visa at the border post. Thankfully custom officers on the other side agreed to let them in and escorted them to a bank so that they could get money and change it to USD. The “kind of official currency” of Zimbabwe has been the US Dollar following the 2007/8 economic crash (officially, there are a number of official currencies, but the dominant one, used by Government, has been the USD). The Government has now (2016) been talking about introducing Bond Notes as the Zimbabwean currency, in an attempt to provide incentive for exports. The Bond Notes should eligibly be used in conjunction with the US Dollar. A short account of the economical state of the past 10 years might help to understand the current uneasiness that the introduction of the Bond Notes and the current cash-less situation is bringing. 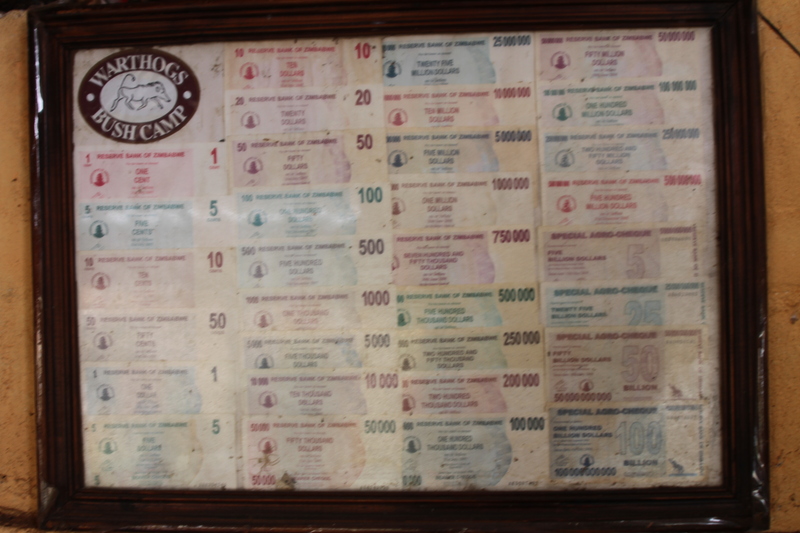 From independence to 2009, Zimbabwe currency was the Zimbabwean Dollar. Economic crisis started in late 1990s and from 2006/7, the economy in the country went down so much that the inflation rocketed through the roof. The final hyperinflation rate has never been officially recorded but mention has been made of the peak being as high as 79.6 billion % (percent) in 2008…. (in essence… massive…. regardless of the real number!). The Zimbabwean Dollar was losing its value at lightning speed. The cost of any commodity would increase nearly every hour at some point. The rising prices were being so steep that the Government had to print higher figures notes (up to 100’000’000’000 [one hundred trillions]). In 2009, the country abandoned the Zimbabwean Dollar, which lost all value (well… the exchange was so bad that it was as if) and the country used multiple currencies. Within Zimbabwe, all currencies from neighbouring countries were used locally: regions bordering Zambia would use the Zambian Kwatcha, those near Botswana would use the Botswana Pula, etc… But those currencies were not necessarily accepted/used country-wide. To streamline the economy, the US Dollar was the main traded currency. Even though it seems that officially most neighbouring currencies are still traded, my experience in Zimbabwe over the last 3 years has been the use of the USD. Withdrawals at any ATM is in USD only. All prices are given in USD only. Even the neighbouring Zambian Kwatcha cannot be obtained at the bank located at the border with Zambia. Up to December 2014, the “official” currency that I used/saw throughout the country was the US Dollar for amount above 1 USD, and the South African Rand (ZAR) for amounts below 1 USD. This was primarily because the US Dollars in circulation were only the bank notes and not the coins. So the Rand was substituted to the US cents coins (along with change in sweets, if no coins available….). Most time, the exchange was easy as the Rand was trading at around R10 for 1USD. And so R1 was 0.1 USD. Bigger denominations were also accepted and for example we could use the Rand instead of USD to pay for Visa at the border (but no other currencies). In December 2014, in an effort to “use only one currency”, and be free of the Rand, the Zimbabwean government introduced the “Bond coins” as the official Zimbabwe division of the USD dollar: 100 Bond Coins = 1 USD. (Personal thought: this is still 2 currencies…., but at least one is local I suppose…). And from Jan/Feb 2015, the Rand was no longer accepted for trading in shops, not even at the border. In the past couple of months, the situation is changing nearly every day, with different stories circulating as to when the Bond Notes will be introduced, if it will be introduced, whether all money in the bank will be changed from current USD to Bond Notes… you hear a lot of different things… but in essence, no-one knows what is really happening. The only certainty is that people cannot access their money. Paying is getting more and more difficult. Time spent in queue is adding a strain on the workforce. Withdrawals have been limited. First to $100, then to $50 and this week to $20. In my view, the one thing that has helped the population to still be able to buy food is the Ecocash system (introduced in 2015 I believe), which allows to make virtual payment in many places, similar to a Visa card, but also allowing individual transfers between people. Something to follow in the next few weeks/months…. Yes it is so unfortunate. Wonder how tourists pay, in dollars? Yeah…local currency will eventually spring up! Just to add another example… just happened… went for farewell drinks as I am leaving tomorrow morning after 6 weeks in the same place.